Modifications: I used kale instead of spinach because I had some I needed to use up. The recipe calls for 2 cups of crushed tomatoes, I just used a single 28 oz can, not sure how that compares. I threw in a couple green onions we had too. Annie & Luke: They didn’t hate it. Notes: This was much better than I had anticipated and thickened up to almost be like chili. The peanut butter, spinach (kale), and cilantro really give this a different flavor than the soups we normally have around here. 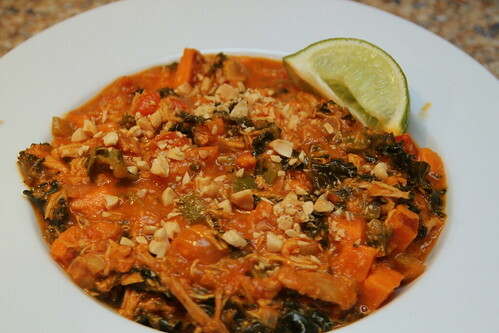 This entry was posted in carrot, celery, chicken, cilantro, garlic, ginger, green onions, green pepper, greens, kale, lime, one dish meal, onion, peanut butter, red pepper, soup, spinach, sweet potato, tomatoes. Bookmark the permalink.